This program is commonly used for commercial, hotel, hospitality, resorts, multifamily, apartment, and construction loans in today’s real estate transactions. generally brought into a transaction to bridge the gap on an acquisition or construction development deal. In the past, mezzanine loans were used generally with senior loans of at least $10 million. Nowadays borrowers have a substantially higher appetite for mezzanine loans that have been fueled by redevelopment & refinancing activity, including the profitable returns of new construction. This surge in activity is due in part to the growing momentum in the real estate market size, shifting loans from $5 million as high as $30 million. Additionally, a tremendous amount of loans are maturing and transactions are undergoing recapitalization. Add in the Dodd Frank regulations with more bank constraints on asset quality, and a substantial new demand for mezzanine financing and mezzanine lenders arises. At Edward Voccola & Co. LLC we specialize in construction loans and mezzanine financing, and can help add value to your projects. Participating debt where interest payments are combined with participation in property income above a specified level. The last two options capture both income and capital appreciation, but at the cost of lower interest rates, higher loan-to-value (LTV), or less favorable contractual terms. Senior secured debt and common equity still make up a majority of real estate transactions. Due to the complexity of some deals, however, some sponsors prefer customized mezzanine financing. Deals with mezzanine debt usually contain 70% mortgage financing, 5%-25% percent mezzanine debt, and the remainder as developer’s equity. Unlike a mortgage, a partnership interest is used as insurance if developer defaults on the loan/equity. This makes mezzanine financing effectively a debt/equity instrument. Mezzanine financing is more comparable with preferred equity investments. Mezzanine financing is generally short-term, and taken out with lower rate debt or property sale for quick exits. They typically have higher interest rates due to a set premium over permanent, senior debt rates. This is a great benefit for investors, but why would sponsoring real estate companies pay this premium? The answer lies in the fact that mezzanine products replace common equity, which is the most expensive type of financing for a developer/sponsor. Because equity holders lose out in the case of a default, investors demand not only a dividend style payment but also a portion of the profits, or “carry,” that the developer would otherwise have to himself. Sponsors who are confident of the potential upside are willing to pay higher “capped” interest rates, which limit the upside appreciation for the lenders and allow more potential benefit to the sponsor. The benefits of mezzanine financing are a combination of both greater risk and higher cost to sponsors. The risk of the increased leverage jeopardizes common equity should property values decline. The cost is in the higher weighted average cost of debt capital, since most mezzanine structures are still debt-like. To investors, the risk is that they are now in a second position behind the senior first-position debt. They also have less equity margins of safety as a buffer. Take the resulting environment of the 2008 market crash, when the value of real estate wiped out these instruments– leading to frozen credit markets and a drastically reduced market for commercial mortgage-backed securities (CMBSs). However, the demand for mezzanine financing never disappeared. Confident developers who have a choice between equity financing of 40% of the project cost with investors demanding a return of 20-25%, compared to a mezzanine piece that would bring that costs down to the 15-20% range for the majority of that needed capital, will choose the mezzanine option. Real estate’s reliable cash flows allow the use of leverage to enhance a sponsor’s returns and to diversify their portfolio. Real estate is also a long-term asset, and a significant equity cushion is needed to ride through the downsides of market cyclicality that inevitably and unexpectedly occur. If that is in place, however, then mezzanine financing can be an appealing solution for both sponsors and investors – which explains why the mezzanine market is currently enjoying a resurgence, now that the economy has largely recovered from its bottom. An owner of an apartment building has a $10 million valuation and a $5 million first lien. The owner wants to pull cash out, but cannot simply refinance because the first mortgage has a lock-out or a huge defeasance prepayment penalty. In this situation, the owner may obtain a $4 million mezzanine loan to free up some cash. An investor wants to buy a partially-vacant $10 million office building in a great location. He acquires the building with a $7.5 million senior acquisition loan at 75% LTV. A mezzanine lender may provide up to $1.5 million, which the owner uses to rehab the property and entice potential tenants. When the vacant space is leased, the property is now worth $12 million, and the owner can refinance the $7.5 million lien to $9 million, eliminating the mezzanine loan and brings the overall interest rate down. Suppose a developer wants to build a hotel. If the total cost is $20 million, a commercial lender would advance $15 million at 75% LTC, and the property has a very high completion value (say $26.6 million). The mezzanine lender may lend the other 25% or $5 million. When completed, the developer switches to a permanent loan at 75% LTV, paying off the mezzanine loan. Mezzanine loans and preferred equity investments are more prevalent in large commercial projects. Lenders will rarely lend with these instruments on commercial projects worth less than $15 million. 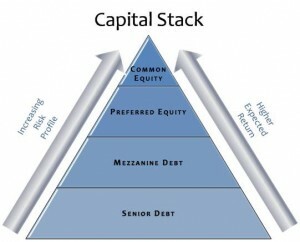 Mezzanine and preferred equity financing are used to achieve high leverage. Traditional banks and life companies will not exceed 80% loan-to-value (LTV) when making commercial mortgage loans, which lead to the use of mezzanine loans and preferred equity investments to stack loan-to-cost ratios as high as 95% and loan-to-value ratios as high as 90%. A mezzanine loan is a loan secured by the membership interests of a limited liability company (LLC) that owns a commercial property. If the LLC fails to make on-time payments, the lender can file a UCC foreclosure on the stock. Once the lender owns the stock, it owns the commercial project as well. A preferred equity investment achieves the same thing. The lender makes an investment of equity with a preferred return in the LLC that owns the big commercial project. If the LLC management cannot pay the preferred member the promised return, the old management is ousted and the former owners of the LLC lose their voting rights, dividends, and distribution of profit. The reason a lender would make a preferred equity investment rather than a normal mezzanine loan is that permanent loan documents prohibit mezzanine loans, so the lenders are forced to make a preferred equity investment. In summary, the direction of the current environment implies that robust demand for mezzanine financing will continue. The numbers are real; talk to Edward Voccola & Co. LLC on how mezzanine financing is optimizing the capital structures of real estate owners by lowering the cost of capital that can be released, creating significant value, and improving equity returns.